Richard Waite Associate, WRI’s Food Program. Beef and climate change are in the news these days, from cows' alleged high-methane farts (fact check: they're actually mostly high-methane burps) to comparisons with cars and airplanes (fact check: the world needs to reduce emissions from fossil fuels and agriculture to sufficiently rein in global warming). And as with so many things in the public sphere lately, it's easy for the conversation to get polarized. Animal-based foods are nutritious and especially important to livelihoods and diets in developing countries, but they are also inefficient resource users. Beef production is becoming more efficient, but forests are still being cut down for new pasture. People say they want to eat more plants, but meat consumption is still rising. All of the above statements are true even if they seem contradictory. That's what makes the beef and sustainability discussion so complicated — and so contentious. The longer explanation: Cows and other ruminant animals (like goats and sheep) emit methane, a potent greenhouse gas, as they digest grasses and plants. This process is called "enteric fermentation," and it's the origin of cows' burps. Methane is also emitted from manure, and nitrous oxide, another powerful greenhouse gas, is emitted from ruminant wastes on pastures and chemical fertilizers used on crops produced for cattle feed. The longer explanation: Ruminant animals have lower growth and reproduction rates than pigs and poultry, so they require a higher amount of feed per unit of meat produced. Animal feed requires land to grow, which has a carbon cost associated with it, as we discuss below. 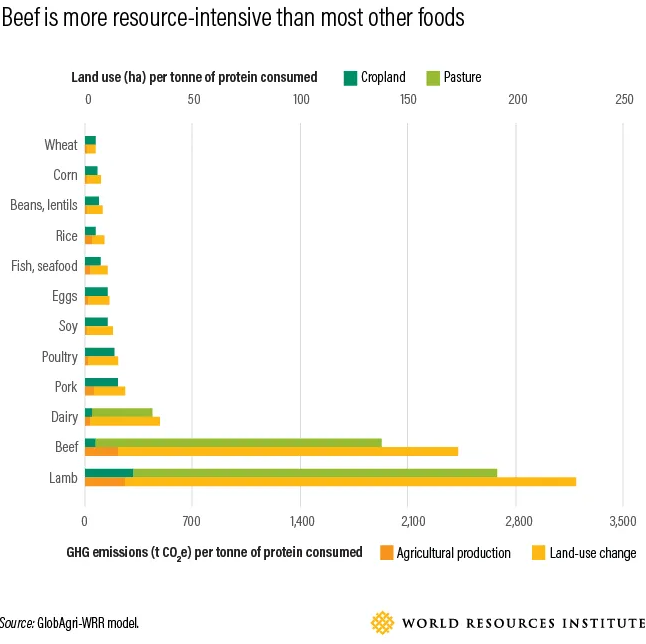 All told, beef is more resource-intensive to produce than most other kinds of meat, and animal-based foods overall are more resource-intensive than plant-based foods. Beef requires 20 times more land and emits 20 times more GHG emissions per gram of edible protein than common plant proteins, such as beans. And while the majority of the world's grasslands cannot grow crops or trees, such "native grasslands" are already heavily used for livestock production, meaning additional beef demand will likely increase pressure on forests. While all of these estimates account for emissions from U.S. agricultural production, they leave out a crucial element: emissions associated with devoting land to agriculture. An acre of land devoted to food production is often an acre that could store far more carbon if allowed to grow forest or its native vegetation. And when considering the emissions associated with domestic beef production, you can't just look within national borders, especially since global beef demand is on the rise. Because food is a global commodity, what is consumed in one country can drive land use impacts and emissions in another. An increase in U.S. beef consumption, for example, can result in deforestation to make way for pastureland in Latin America. Conversely, a decrease in U.S. beef consumption can avoid deforestation (and land-use-change emissions) abroad. When these land-use effects of beef production are accounted for, we found that the GHG impacts associated with the average American-style diet actually come close to per capita U.S. energy-related emissions. A related analysis found that the average European's diet-related emissions, when accounting for land-use impacts, are similar to the per capita emissions typically assigned to each European's consumption of all goods and services, including energy. There are also emerging technologies that can further reduce cows' burping, such as through feed additives like 3-nitrooxypropan (3-NOP). Improving manure management and using technologies that prevent nitrogen in animal waste from turning into nitrous oxide can also reduce agricultural emissions. The longer explanation: Reining in climate change won't require everyone to become vegetarian or vegan, or even to stop eating beef. If ruminant meat consumption in high-consuming countries declined to about 50 calories a day or 1.5 burgers per person per week — about half of current U.S. levels and 25 percent below current European levels, but still well above the national average for most countries — it would nearly eliminate the need for additional agricultural expansion (and associated deforestation), even in a world with 10 billion people. In addition, major meat companies — including Tyson Foods, Cargill, Maple Leaf Foods and Perdue — are starting to invest in the fast-growing alternative protein market. They're positioning themselves more broadly as "protein companies," even as they work to reduce emissions from beef production in their supply chains through improved production practices. 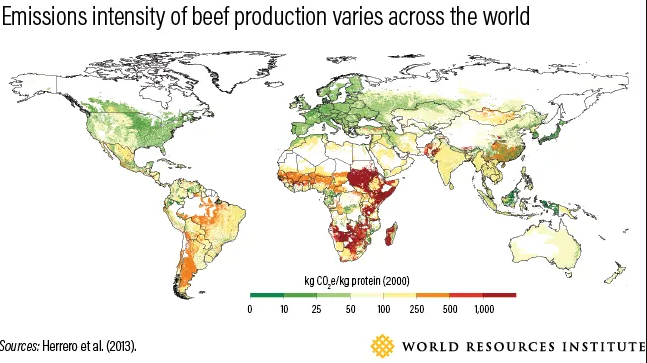 Beef is more resource-intensive than most other foods and has a substantial impact on the climate. A sustainable food future will require a range of strategies from farm to plate. Food producers and consumers alike have a role to play in reducing beef's emissions as the global population continues to grow. And as we all work on strategies to curb climate change — whether in the agriculture sector, the energy sector or beyond — it's important we rely on the best available information to make decisions. Richard Waite, Associate, WRI’s Food Program.